Little Independent is an interesting Chicago-based site where traditional shopping meets e-commerce. Rather than sell their items exclusively online, Little Independent gives small indie shops a place to showcase their products, encouraging customers to visit the stores themselves. Currently US-only, Little Independent has listings from 66 shops in 13 states, including New York and California. While the site’s interface and design leaves a lot to be desired, the concept is brilliant. 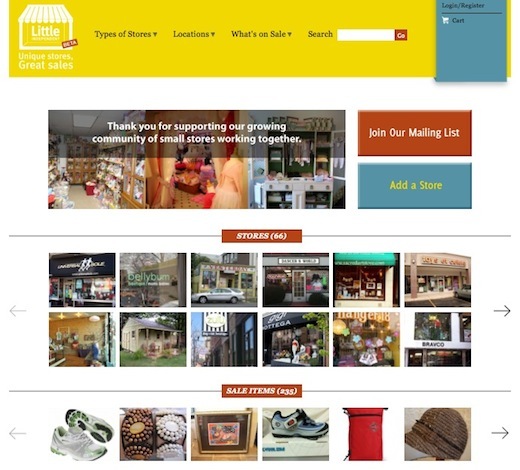 Each store has a profile page, featuring a photo of the storefront, contact and address information, and a short introduction to the store. Stores can also list the types of items available for sale, as well as actual products. When it comes to purchasing products, Little Independent acts mostly as a directory. Each product is accompanied by a list of ways to buy the item, including links to the store’s own online shop, in-store sales, by telephone or through Little Independent itself, although the latter appears to be a rare option. Little Independent is acting more as a passive middle man, giving these stores a place to showcase their stores and products. The site’s interesting twist is that it seems to be focusing on bringing more foot traffic into the stores, rather than selling items online. If stores want to list themselves on the site, they can do so for free, as long as they meet a certain set of criteria. Stores must operate out of a brick and mortar storefront with a street address and a telephone number with the majority of sales made locally in the store. The stores must also be privately owned and sell retail, not wholesale. The online marketplace makes it incredibly easy to discover little, independent stores in your city that you might have otherwise overlooked. Some of the products and stores showcased on Little Independent are reminiscent of Etsy, but with the significant difference that these sellers have taken the plunge and invested in a brick and mortar store. Little Independent is the perfect marriage between online and traditional commerce, and if it continues to grow, it has the potential to become an incredibly useful directory of indie stores around the US, and possibly, the world.